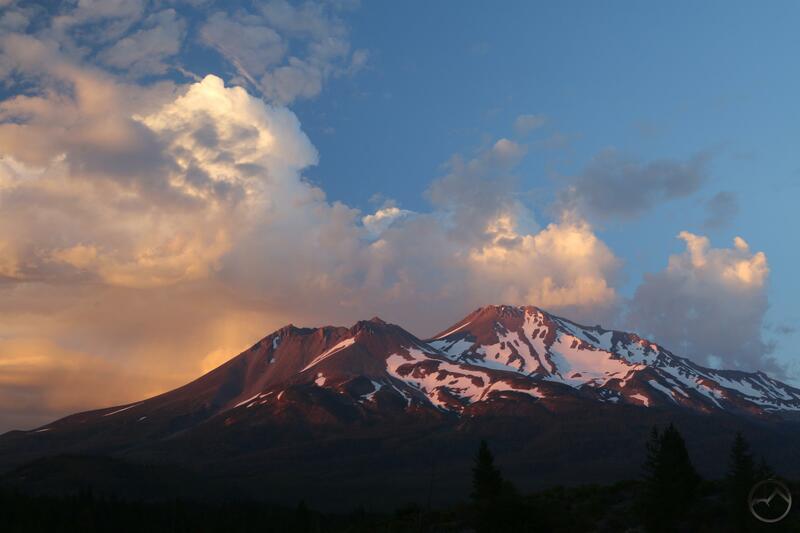 Magnificent alpenglow on Mount Shasta. It has been a few weeks since Mount Shasta has been embellished by a spectacular cloud display. Last night I even griped about the absence of sunset fireworks around the mountain and sifted through my lenticular cloud gallery as a reminder that, yes, there are great sunset spectaculars around the mountain, even in the heat of the summer. Providentially, the very next evening the mountain was beset by towering thunderheads rising majestically above Mount Shasta. As the sun set, they turned vibrant shades of orange, pink and red. It was a marvelous sight to behold. The show was made even more enjoyable since, while standing behind my tripod capturing the images, I was able to chat on the phone with my brother about his oldest son, who is in the midst of his pleb summer at the U.S. Naval Academy. In my book, that is an excellent and memorable sunset! The Mumbo Lakes lie at the head of Mumbo Basin. Most of the lakes in the Trinity Divide are found on the range’s east side. Excluding the rarely visited southern third of the range, there are only three lake basins that feed west into the Trinity River. The most heavily visited is Deadfall Basin, which rates among the most well known and beautiful in the entire range. Further south lies solitary Picayune Lake, which, being on private property, is not a destination for hikers. This leaves Mumbo Basin as the only other lake basin on the west side of the Divide. However, the lakes are only a small component of this large mountain bowl. Rugged peaks and ridges, remote forests, lush meadows, lively Mumbo Creek and great views of the Trinity Alps are also highlights of this area. In spite of all these great features and access by way of a good paved road, Mumbo Basin tends to be overlooked as a good destination for exploring. The lack of attention is due, no doubt, to the lack of established trails in the area. This should not preclude motivated hikers from venturing out to the west side of the Trinity Divide and exploring the ridges and roads that permeate the area. Most people who do head into Mumbo Basin do so to reach Mumbo Lake. It is among the smaller lakes in the Trinity Divide but it is easily accessible via the paved road just a short distance past Gumboot Saddle. It is a good lake for swimming and camping. Hikers comfortable with cross country travel can climb higher into the uppermost section of the basin and find shallow Upper Mumbo Lake. The rocky summit of Peak 7,149, also dubbed Many Lakes Mountain rises above the Mumbo Lakes, giving them a very scenic backdrop. 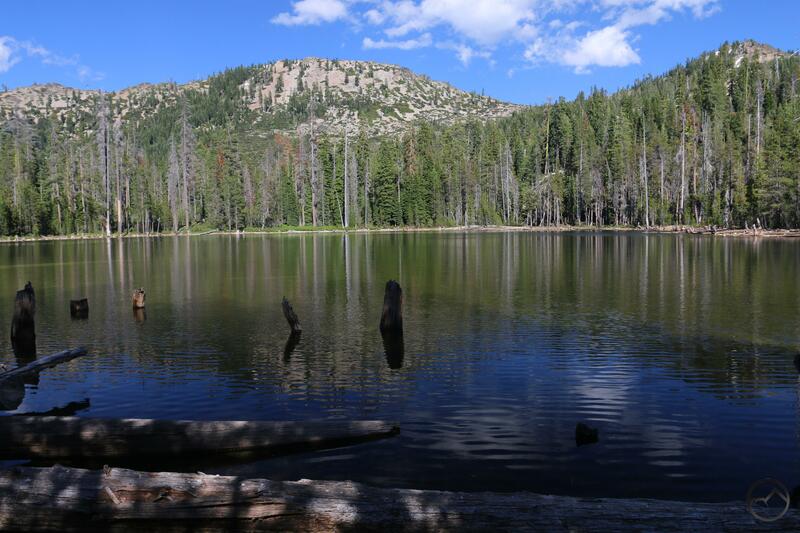 The Pacific Crest Trail cuts across the flanks of this peak, high above the lake, which also offers great views of the basin. Though there are no really established trails, there are a few good options for adventurous hikers. The most trail-like option is the remnants of the old Blue Divide Trail. This was once a trail that descended from the crest of the Trinity Divide down to ridges directly above the main branch of the Trinity River. The trail has essentially been abandoned but many sections of the path are still extant and open to hikers. Following roads along the north rim of Mumbo Basin, it is possible to pick up the trail and proceed out to an overlook with spectacular views of the Trinity Alps, the Scott Mountains, Mount Eddy and Mount Shasta, as well as Mumbo Basin itself. The trail continues beyond the vista but the destinations become more ambiguous. Even when the Blue Divide Trail was a maintained path, this was one of the few trails on the western side of the Trinity Divide. Now, other than Deadfall Basin, there are none. Though the area has experienced a lot of logging, it would be nice to see some old trails rehabilitated or new ones built. The other good option for hikers is the cross country scramble along a ridge on the south side of Mumbo Basin. This route has a very faint use trail at the beginning and then quickly becomes a simple scramble with no trail along the ridge. Fortunately, the terrain is pretty open and easy to follow and does not require much bushwhacking. Small meadows lie immediately below the ridge and hikers have good views of these as well the interior of Mumbo Basin. It also affords the unusual perspective of Mount Shasta rising above the crest of the Trinity Divide. The hike ends at the terminus of the ridge where there are incredible views of the Trinity Alps to the west. The nearest points of the Trinities lie just a few miles distant, on the far side of the Trinity River. Some of this hike crosses private timber land but passage is OK as long as there is no camping and no fires. The one consistent feature of the Blue Divide Trail and the South Mumbo Scramble is great views of the Trinity Alps. Being on the west side of the Trinity Divide means that the rugged mountains of the Trinties are more easily observed than from other places in the Trinity Divide. Now is a great time to head up to Mumbo Basin and experience a somewhat more unusual hiking experience than you normally find in most of the rest of the Trinity Divide! Mumbo Basin from the Blue Divide Trail. 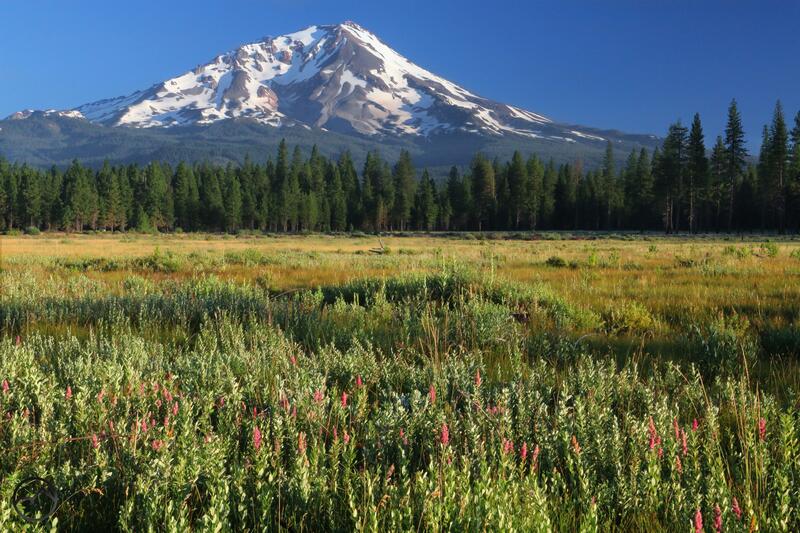 A spectacular morning view of Mount Shasta from the proposed Konwakiton Trail. For the last several years, I have been highlighting the trails in the Mount Shasta area. We are blessed with a number of great tracks that lead to some truly stunning destinations. However, there remain a host of places that lack trails accessing them or the trail network is incomplete and could be significantly enhanced by the presence of a few more miles of trail. Some of these are in wilderness areas and the approval of construction in the protected land seems unlikely. Others are just not interesting enough to attract the effort necessary for the labor and money to be invested in these projects. This is OK, since it leaves these areas to the motivated and adventurous and promises that these secret spots will remain as they are. That said, there are still some places that I think warrant the effort to build. 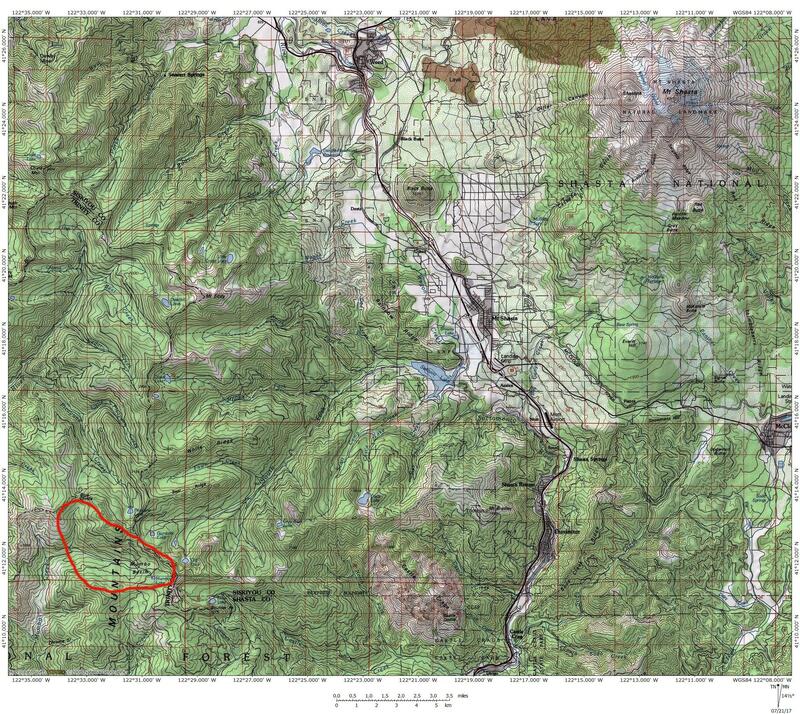 I believe these trails would instantly become classic Mount Shasta area trails and get significant use. 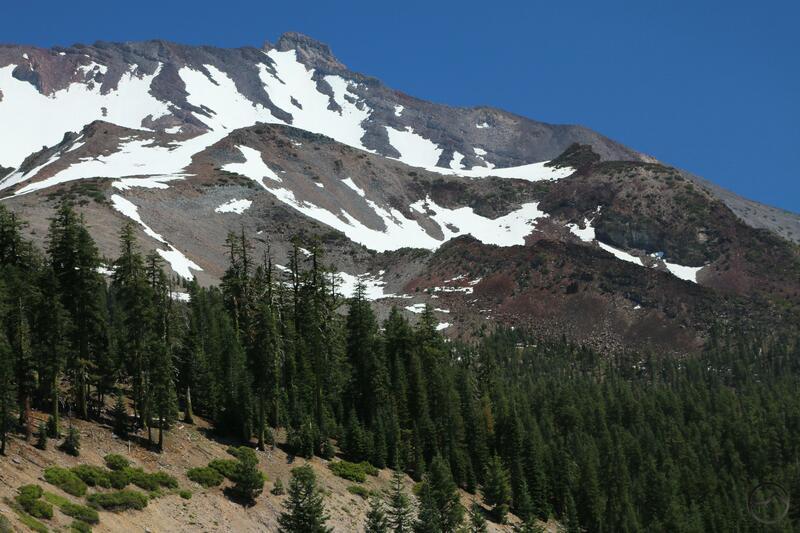 Their addition would make an already great Mount Shasta hiking experience even better than it already is. Unfortunately, the likelihood of many of these ideas coming to fruition are minimal. The Forest Service suffers from a lack of funding that impairs the possibility of many improvements to the trails. They want to make the hiking experience around Mount Shasta as good as it can be but the obstacles are great. Volunteer contributions are absolutely necessary. This ranges from actual trail construction to the commitment of significant funds to pay for the NEPA process (which is a major problem on its own!). Working through organizations like the Mount Shasta Trails Association is the best way to bring new trails into being. I may expand on each of my proposals in individual posts. I would be interested in feedback you may have on any of these suggested trails. 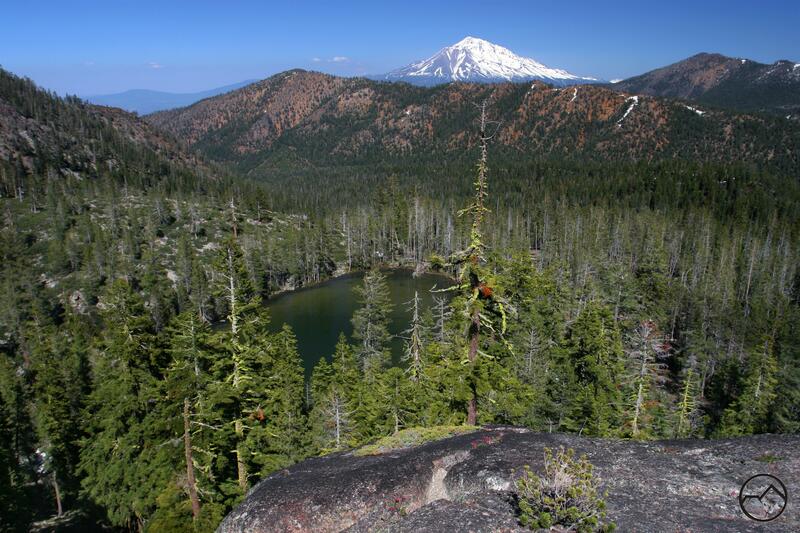 Deadfall Basin and Mount Eddy are classic destinations for hikers in the Mount Shasta area. The basin is filled with gorgeous lakes, awesome wildflowers and fascinating geology. There are two options for reaching the Deadfall area. Most hikers follow the Pacific Crest Trail from the Parks Creek Trailhead while others begin at the Deadfall Meadow Trailhead. The former is longer but requires almost no elevation gain. It has good views of the Scott Mountains and some particularly lush wildflowers as well as refreshing springs. The latter route is shorter but requires more climbing. It ascends into the basin through Deadfall Meadow, which is filled with creeks and even more impressive wildflowers and lush mountain gardens. These two routes each have much to recommend them. Unfortunately, they cannot be combined into a single trip without walking on the steep paved road that connects the trailheads. However, the two trails make up 75% of what could be a really excellent loop hike. Trinity Vista Trail view of the snowy Trinity Alps. To complete the loop, it would be necessary to construct about 1.75 of trail across the slopes that lie between Deadfall Creek and the road descending from the Parks Creek Trailhead. The addition of this trail would afford hikers the chance to hike into Deadfall Basin (and continue on to Mount Eddy if desired) by way of either the PCT or the Deadfall Meadow Trail and then return by the other route. This would allow for a much more diverse and scenic trip. What would the addition offer in terms of scenery? The area is mostly wooded but there are opening where vistas would be available. 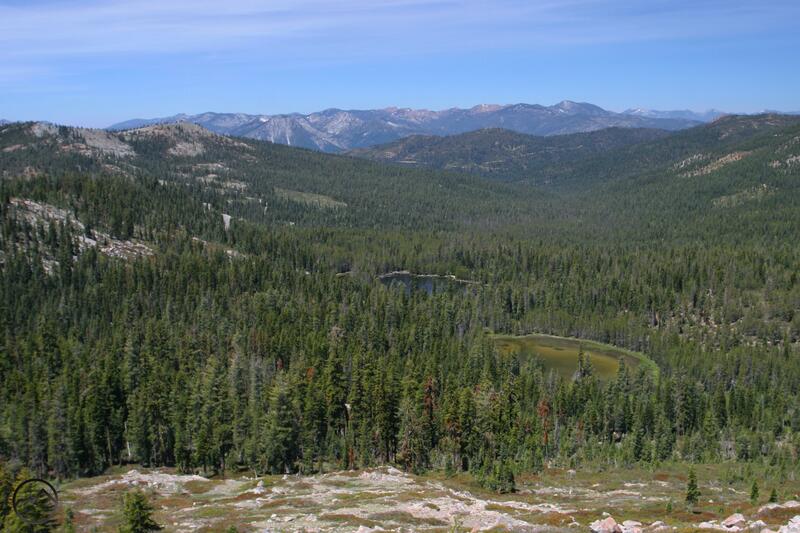 What is most notable is the opportunity to look out to the west where there is a spectacular view of the Trinity Alps. From the trail, the Bear Lake Basin is only 12 miles to the west and presents an grand foreground to the sawtooth-like horizon of the Trinities. This is particularly true near the top of the climb. 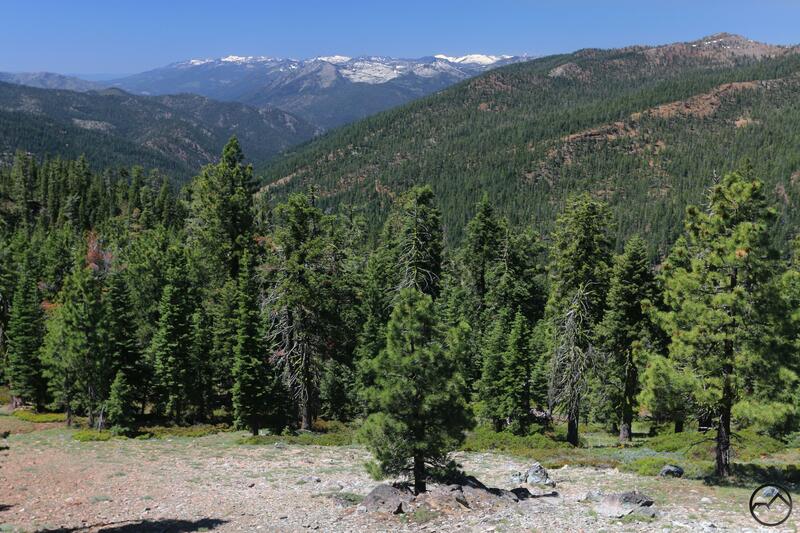 Not only would the trail allow for the loop option to be employed, but for hikers only looking for a quick outing, the upper section, with its views of the Trinity Alps, would be an excellent easy walk. 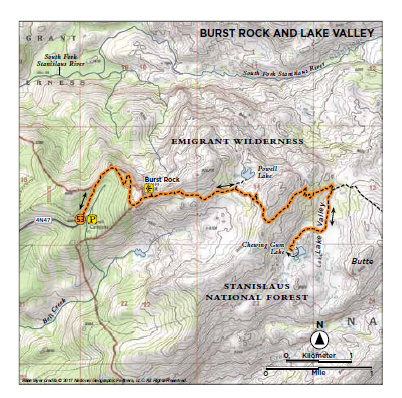 For several years now I have been discussing the need to build trail sections that would allow for a backpacking loop that combined the Sisson-Callahan Trail, the Pacific Crest Trail, the Castle Lake Trail and the Lake Siskiyou Trail. I dubbed this proposed circuit the Headwaters Loop since it would completely encircle the three headwaters forks of the Sacramento River. Most of the loop is already built. An unofficial but established loop trail connects the PCT and Castle Lake. Though less than ideal, a dirt road follows much of Castle Lake Creek’s journey down to Lake Siskiyou. The most obvious hole in the loop is the section that would connect the Lake Siskiyou Trail with the Sisson-Callahan Trail at the North Fork of the Sacramento. Hikers would have great views of Mt. Eddy along the river. While this section of trail would be a key piece of the Headwaters Loop puzzle, I have a bit of a grander conception of what it offers. I propose building trail 1.75 miles from the inlet at Lake Siskiyou along the Sacramento River to the Sisson-Callahan Trailhead. However, more ambitiously, I propose building a sturdy wooden bridge (I will elaborate extensively on the bridge when I expand on this trail in a future post) across the Sacramento River and adding a section of trail that loops back to the inlet along the southern side of the river. This would accomplish several things. Naturally it would help complete the bacpacking loop I have suggested. More importantly, it would extend the Lake Siskiyou Trail along a beautiful section of the Sacramento River. This would allow the loop around the lake to be hiked all year when the seasonal bridges are not in place. When the seasonal bridges are in position, it would give hikers the option of doing a beautiful loop hike around a lovely section of the Sacramento River. A new trailhead could be built on South Fork Road at the place where the road makes a sharp turn to the west and begins to parallel the river. This would add more access to the Lake Siskiyou Trail and provide a good starting point for hikers sticking to the shorter river loop. This would have the further benefit of cutting down on vagrant encampments in this area. 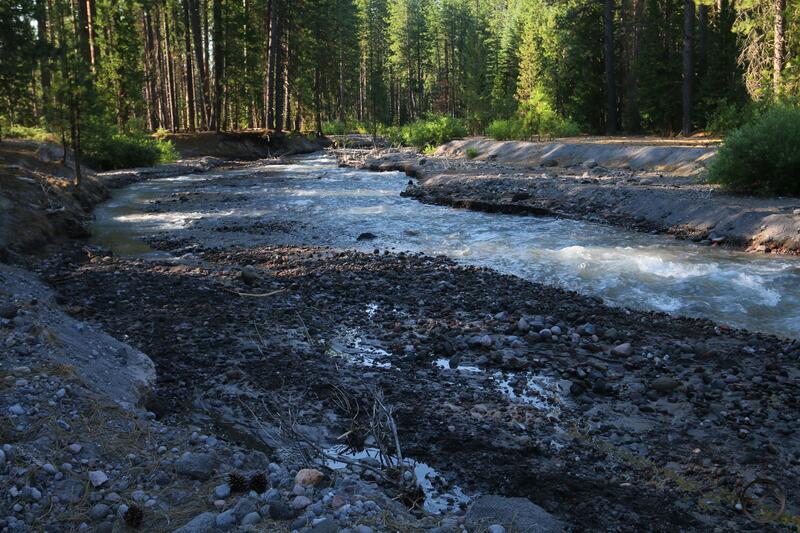 All in all, this has the potential to become one of the most popular sections of trail in the Mount Shasta City area. View towards the bowls and the area covered by the trail. The upper reach of Everitt Memorial Highway has several awesome trails. Whether heading to the numerous destinations from Bunny Flat or Panther Meadow or the Old Ski Bowl, hikers are guaranteed spectacular scenery. The area is actually rather dense with trails, though they are generally divided between the lower ones originating at Bunny Flat and the upper trails that begin in the Old Ski Bowl area. The two sets of hikes are not connected by any maintained path. Whats more, the road to the Old Ski Bowl remains closed much of the year and the upper destinations are not accessible. This brings up my third proposed trail, which would run parallel to the Everitt Memorial Highway and connect Bunny Flat to the Old Ski Bowl. It would also be possible to add a spur trail that would split off and reach the road across from the entrance to the Panther Meadow parking area. Up until now, I have dubbed the route the Bowl Trail since it would pass beneath Sun Bowl and Powder Bowl, which lie on the south side of Green Butte Ridge. This trail would accomplish several things. First, it would allow motivated hikers to reach the upper destinations earlier in the year. Obviously this is contrary to why the road remains closed but I believe the number of people heading up there on foot would be dramatically less than would reach the area in cars. Furthermore, hikers can already simply walk on the road to Panther Meadow. An established trail would be a much more pleasant way to channel people there. In fact, if the path simply went to the Old Ski Bowl without a spur to Panther Meadow, it would probably reduce the number of people who went to the meadow, since that area would be bypassed and lead straight to the Old Ski Bowl. The other benefit would be a fantastic loop that would connect both the Horse Camp Trail and the Green Butte Ridge Trail with the Old Ski Bowl Trail and facilitate a truly fantastic loop hike that would circumnavigate Green Butte. This route would require some rock scrambling over Green Butte Ridge but for those prepared of such a journey, it would be an epic hike. Mount Shasta viewed from above Lower Caldwell Lake. The high point of the Scott Mountains and the 4th highest peak in the Mount Shasta area, China Mountain is a criminally overlooked alpine destination. 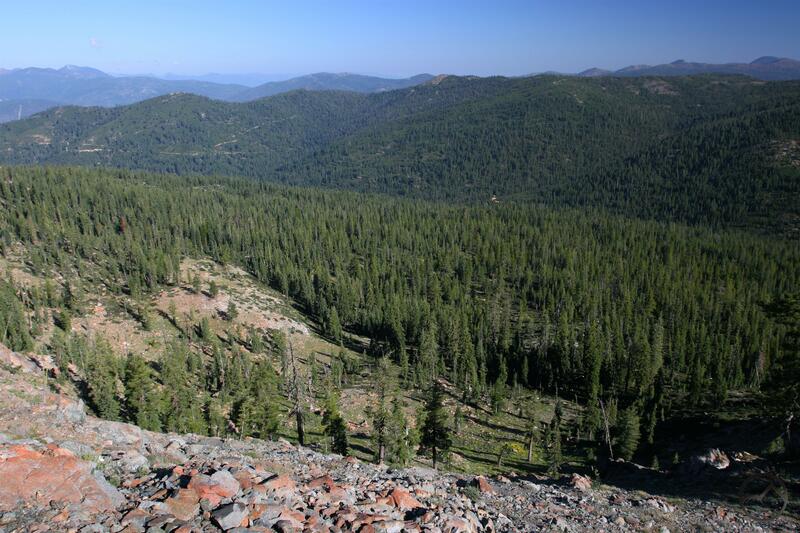 The tall peak rises at the eastern end of the Scotts, like the prow of a massive ship overlooking the Shasta Valley, which lies a mile below the summit. It is perhaps overlooked since it lakes a distinctive profile and much of its flanks are covered with dense forests. However, this hides the true character of the higher portions of the mountain. The summit of China Mountain is surrounded by three lake basins. While none of them house large lakes, the lakes themselves are still scenic and the rugged terrain that looms above them as very scenic. In many ways, the loop around China Mountain would be similar to the excellent Four Lakes Loop in the Trinity Alps. None of the lakes on China Mountain rise to the spectacular level of beauty as the four that lie around Siligo Peak but they are nonetheless beautiful. What the loop around lakes on China has, though, is eye-in-the-sky vistas that reach for great distances in every direction. These views would take in much of southern Oregon, Mount Shasta and a vast span of the Klamath Mountains including the Trinity Divide, Scott Mountains, Trinity Alps, Russian Wilderness, Marble Mountains and the Siskiyous. Take that Four Lakes Loop! China Mountain is flanked by three basins that contain lakes as well as a 4th that has some large meadows in place of a lake. A 5th basin, High Camp Basin, lies immediately to the south and the highest corner of it makes the best passage for the trail. Two lake basins, the West Park Lakes and the Caldwell Lakes are headwaters for Parks Creek, which is a major tributary of the Shasta River. Crater Lake has no out let, but along with the meadow-filled basin, is in the Scott River watershed. High Camp Basin is one of the two sources of the mighty Trinity River. The ups and downs of the loop around the mountain, which would include a spur up to the summit of China Mountain would cross through three major watersheds! I think this trail would be destined to become a classic Mount Shasta area adventure! In many ways, this is the trail that I have the grandest vision for and excites me the most. 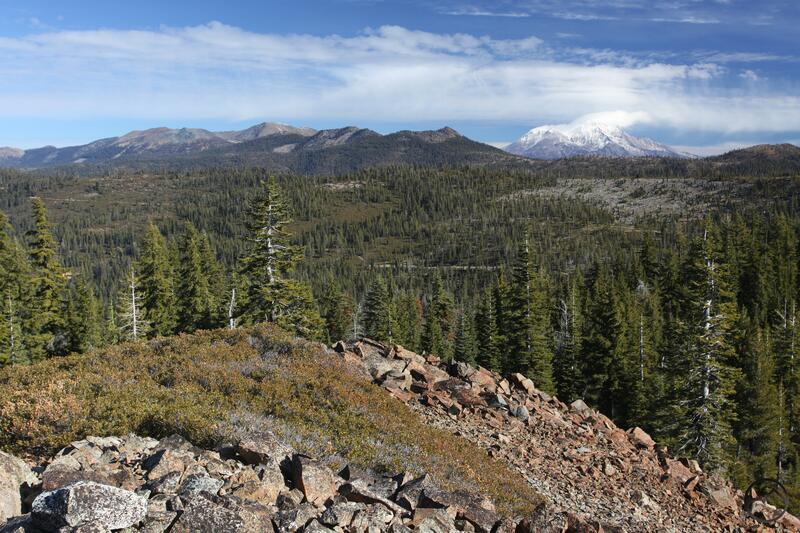 This trail combines an unusual creek, interesting volcanic and glacial geology, lush meadows and staggering views of one of Mount Shasta’s most beautiful profiles. The genesis of this trail concept began with the frustration over the lack of trails in the McCloud area. Basically all the hikes near the town were along the McCloud River. 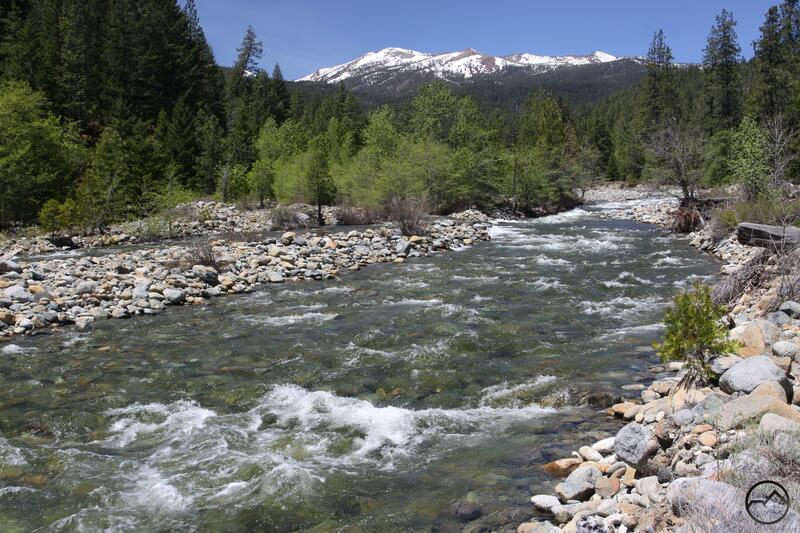 Squaw Valley Creek is an outlier but offers similar scenery to what is found along the river. Equally frustrating was the near total lack of views of Mount Shasta from any of these trails. I have written about how McCloud is an under-rated hiking destination but the lack of diversity and views of the mountain continued to nag at me. I have hunted around for features and places that would offer some interest to highlight this beautiful area. The one place I kept coming back to was infamous Mud Creek. Hiking Northern California Released Today! I am excited to announce that my latest book, Hiking Northern California, is officially released today! 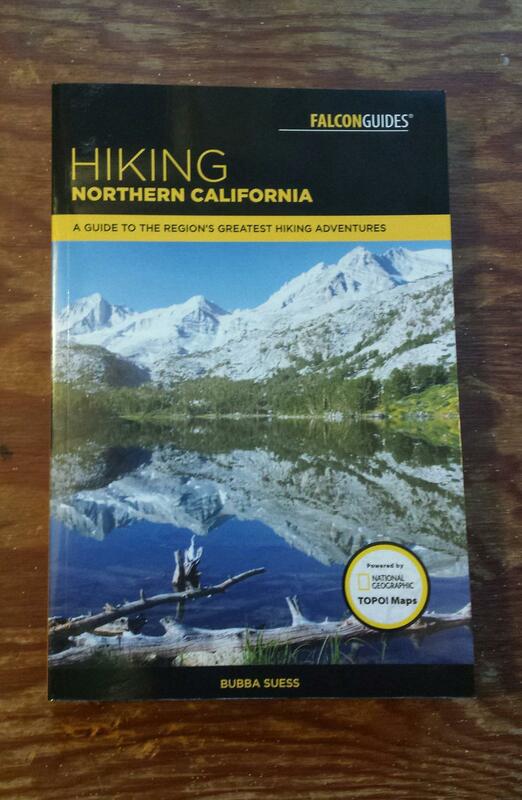 The book contains 80 of the best hikes throughout Northern California. It is a showcase for the magnificent natural beauty of this part of America and highlights just how diverse the northern part of the Golden State is! I am truly humbled to have been able to write about such an incredible place. Tackling such an immense area, so loaded with exceptional hikes and natural wonders was challenging. How do I narrow down an area so densely packed with excellent trails into only 80 hikes? One significant step in this process was to break down the state into 9 regions. Each area has its own distinct character and exciting trails to be explored. I tried to have somewhere around 10 trails per area, give or take a few, so that there was equal representation of each region. I did include the Sacramento Valley as one of the nine sections but only included two trails there, which allowed me to pad some of the other sections. The Sierra Nevada, California’s quintessential mountains range is so vast that I could not leave it as a single region. Instead, it was broken up into four areas. These divisions were based on geology, use and routes of access. 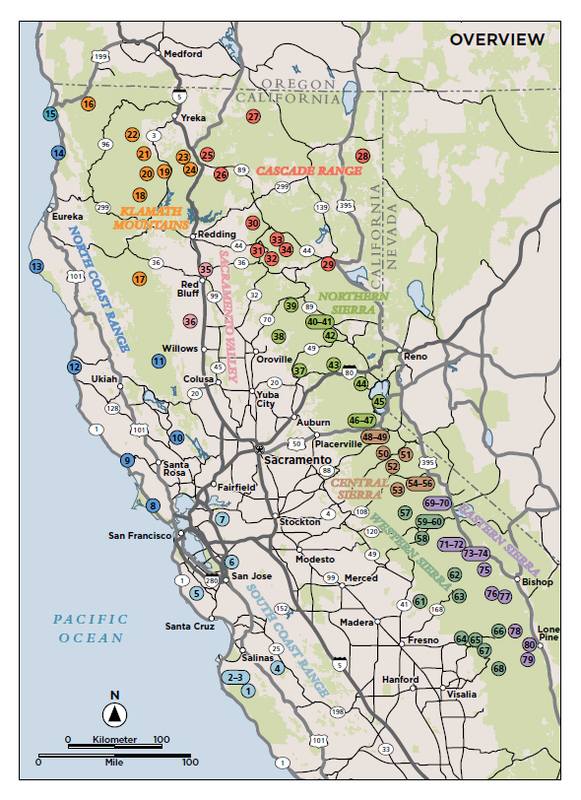 By dividing Northern California in this way, it allowed me to distribute the trails fairly evenly around the state. Though there were many trails in each section I was forced to leave out, I think each region is given a chance to shine brightly. One great feature of the new editions being produced by Falcon Guides is the maps. In early editions by the publisher, maps were black and white and only gave the vaguest sense of how the trail related to the land. When I began writing for them nearly 4 years ago, the maps had improved significantly. 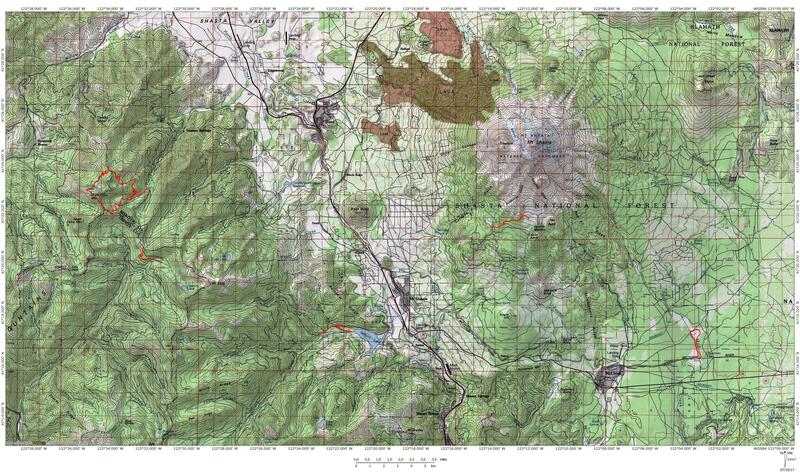 They were multi-colored and based on USGS topo maps. Unfortunately, they lacked topolines. Many natural features were still present so orienting the maps was less difficult but still not ideal. 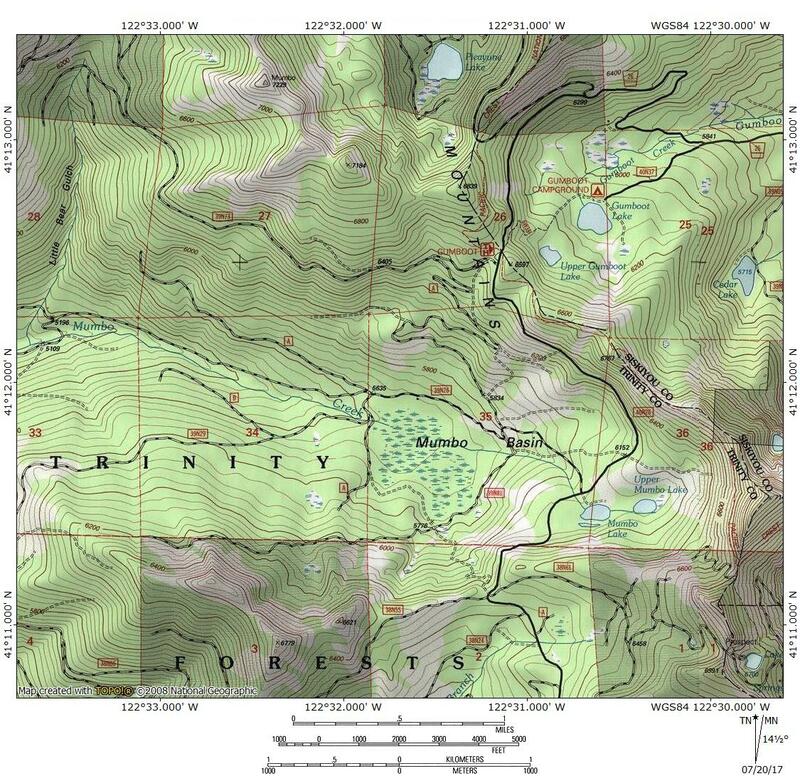 Now, with Hiking Northern California, the maps have evolved into their best possible form by utilizing the topo maps and overlaying the other date typically present on Falcon Guide maps. The final result is both beautiful and especially useful. Speaking frankly, this is a grand book. At 438 pages, it is much larger than my previous two books. Visually, it is a stunning volume, loaded with nearly 300 color images. More than half the trails have three images per hike. Some even have four images. Coupled with the excellent maps, the book just looks awesome. Though it is loaded with excellent beta, I honestly think it works equally well as a coffee table book. You can set it out and let folks sift through it, seeing the best of Northern California. This is true whether you want to show off the Golden State or dream of getting out here. Indeed, I tried to write it in such a way as it will have lots of accurate beta for hikers, but also in a way where readers can experience and enjoy Northern California vicariously through word and image. Hopefully I was successful. I am very, very proud of this book. It is gorgeous, but more than that, I was able to write about some of the most beautiful places in the world. It is an honor to be able to publish thoughts about places like Big Sur, Lassen, Lake Tahoe, Yosemite and beyond. Wherever you are in Northern California, there are going to be nearby trails in the book that will be absolutely amazing and exciting journeys through this wonderful land. It is my sincere hope that this book will contribute to many people building lifetime memories while exploring the wild, beauty of the land of Northern California. Copies can be purchased here. I will also have a few copies available. If anyone is passing through Mount Shasta and wants a signed copy, let me know ahead of time and I can arrange delivery. Thanks for supporting this site and purchasing a copy. You will enjoy it!